A list of the best crypto resources. Some are affiliate links, most are not, but I only promote things that I either use or have seen other people use to get results. Where do I go to buy Bitcoin? If you are just getting started, you should buy your first Bitcoin using Coinbase. My best advice is to use the easiest option and get your first Bitcoin. Figure out the rest later. It blows my mind how many people waste weeks of their life trying to get this perfect. Just use Coinbase. Where Do I Buy Altcoins? There are other sites that offer unique coins but for the most part Bittrex is where you want to spend your time. They offer great speed and service. Where can I learn technical analysis? YouTube. Go to YouTube and search for “chart technical analysis” and get going. It’s free and many people have used this to make millions of dollars. BabyPips.com – this is a free course about trading Forex (foreign exchange currencies). This will teach you a lot of information that you can apply to crypto charts. Skill Incubator Crypto . Chris Dunn and Rocky Darius are as legit as it gets in the crypto trading world. They offer awesome technical trading classes (plus live groups, trade calls, etc) for paying customers. If you are looking for structure and crypto specific training, this is the best I’ve seen. The best wallet to buy is a hardware wallet. This is the best investment you can make in crypto. Bar non. Get one immediately. This will offer you protection for your valuable coins in an offline way – you can store them in your nuclear safe room bunker and never have to think about it again. 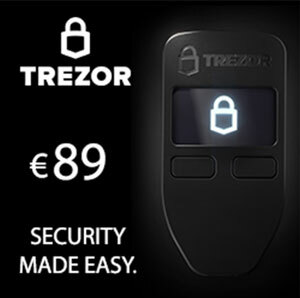 The two best are Trezor and Ledger Nano S.
I prefer the Trezor, some prefer the Ledger. Just pick one and buy it. This is important. What about coins that aren’t compatible with the hardware wallets? In this case, you should Google the name of the coin, go to the website and find out what solutions they offer. Most of the time they will offer a desktop wallet you can download + use. Sometimes they will offer a mobile wallet or a web wallet. Follow the instructions and you have a wallet. NOTE: Many people leave their coins on an exchange like Bittrex because they get lazy about moving the coins to an offline wallet or they are worried about transaction fees (a few bucks). One of the best possible ways to get hacked and lose all your money is to leave your money on an exchange. You MUST move your coins to desktop, mobile, web or hardware wallets as often as possible. Do not leave your funds on an exchange for more than a few hours. What’s the name of that Chrome Extension you use that switches the price in Bittrex to USD? This is not my extension and I do not personally know the developer. What is the best software for looking at coin charts? Some people prefer Coinigy which has a monthly subscription but I don’t use enough charts to make it worthwhile investment. What apps should I use to track my coins?